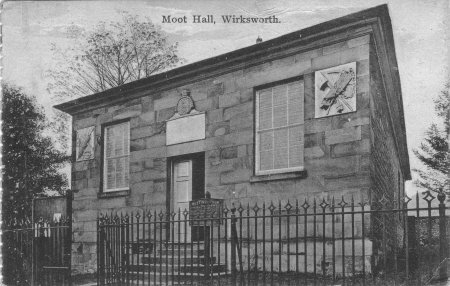 The present Moot Hall in Chapel Lane. From an original painting by Sarah C Millward. The Old Moot Hall in Market Place. 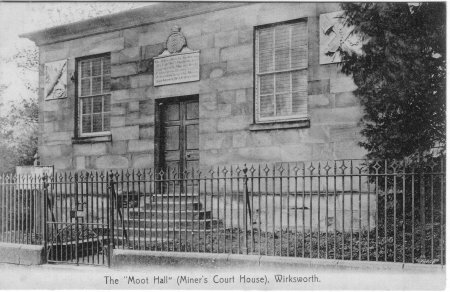 The present Moot Hall in Chapel Lane was built in 1814 to house the Barmote Court, which was set up in 1288 to enforce lead mining laws, which were said even at that time to be of great antiquity. 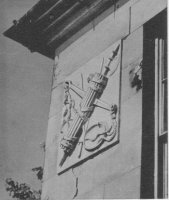 It is almost certainly the oldest industrial court in Britain, and possibly in the world; it still sits twice a year at the Moot Hall. At Barmote courts lead was measured in a special dish (which still exists), disputes settled and taxes were collected. Although very little lead is mined in the area today, the tradition is still held. The High Peak Barmote Court was set up under an Act of 1851, and the Wirksworth Barmote Court by an Act of 1852. 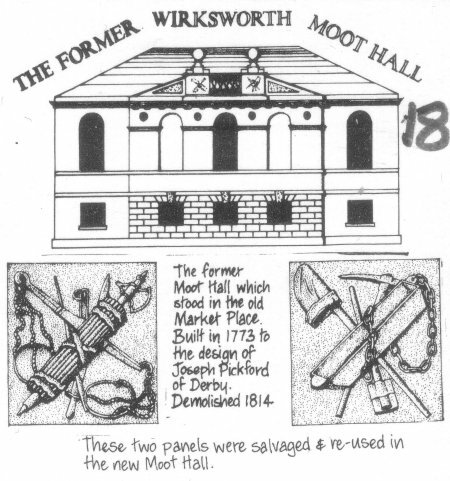 They have met in the Moot Hall in Wirksworth since 1814. Since 1994, the Barmote Courts have met once a year, in April. The Grand Jury is formed of twelve members resident within the jurisdiction of the Court in the High Peak or working within Wirksworth. They sit before a miners' standard dish, made in the reign of Henry VIII, and originally used for testing the miners' wooden dishes against the regulation model. At meetings, bread, cheese, clay pipes and tobacco are still provided. 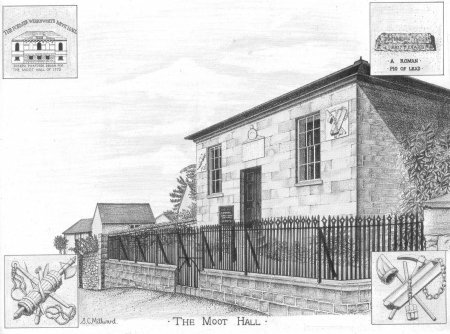 A county court sits monthly at the Moot Hall, rebuilt in 1814 by the Hon. Charles Bathurst, then chancellor of the duchy. In this hall is preserved the hoppet or standard brass dish of Henry VIII. 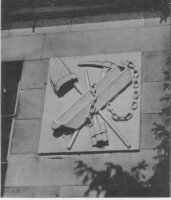 's time for measuring the ores, and in it are also held the barmote courts twice a year before the steward of the manor to determine all disputes and offences against the ancient customs as defined and amended by the Derbyshire Mining Customs and Mineral Courts Act, 1852. 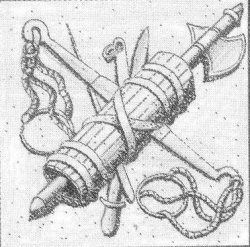 The code of laws and customs by which these courts are governed closely resemble those of the stanneries of Cornwall; one custom is, that every person has the privilege of digging and searching for lead ore in any part of the "King's Field", which comprehends the greater part of the wapentake, and should he discover a vein of lead, he has a right to work it, and erect buildings necessary for that purpose, without making any compensation to the owner of the land. A court of requests was established here in 1837 under a special Act of parliament. Two courts baron annually take place at Easter and Michaelmas, and a court leet at Easter for the king's manor, under the lessee of the crown. The Ecclesiastical Commissioners are now the impropriators. There is also another manor within the parish, called the Holland or Richmond manor, which has no courts, but was granted in 1553 by Henry VIII. to Ralph Gell. 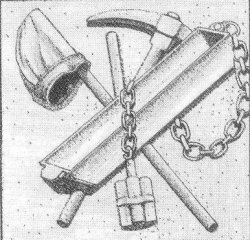 Plaques from the Old Moot Hall, showing Miner's tools of scales, pick and trough.